If you’re looking for a peaceful home that provides spectacular mountain views, I have the perfect property to show you! This three-bedroom, single family home is located between Breckenridge and Frisco, which provides a gorgeous setting you can enjoy year round. For so many wonderful reasons, I’m happy to present this house as my featured property of the month. Backing to an open space, you’re sure to have plenty of privacy while taking in the phenomenal scenery. Also, this lovely home offers lots of spacious rooms, including a main floor master bedroom with a very large walk-in closet. Also, the oversized garage can accommodate two vehicles and still provide a variety of storage options. In addition, you’re free to relax in front of the see-through gas fireplace and take advantage of the separate access to your back deck. Just picture all of the terrific parties you can have overlooking the mountains! Plus, this beautiful, Breckenridge home has a private office that could also be used as a study. One of the nicest aspects of this house is that it can give you all the privacy you need while also being close to downtown Breckenridge and Frisco. You have access to both of these great towns any time you wish. The location alone is a wonderful feature! In short, this three-bedroom home is a real treasure. I adore showing this property because of its great beauty and convenient location near two of the most dynamic towns in Summit County. That’s why I’m confident to say you’ll be a proud owner with such an incredible home. 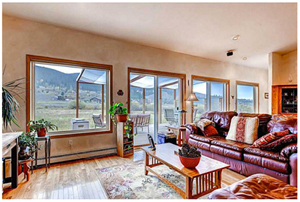 Want More Info on This Breckenridge Property? As you can tell, this amazing home for sale in Breckenridge has so many qualities that make it an outstanding property. If you’d like to see this house in person, let me know. I can arrange a visit right away. Give me a call and I’ll schedule a time that works around your schedule. Also, if you want to view other properties in Breckenridge or throughout Summit County, I’m happy to put together some properties that might meet your needs. You’re always welcome to look through the updated listings on my website, and when you’re ready to discuss your options or prepare for showings, contact me at any time via email ([email protected]) or on my office line. I look forward to working with you to find your perfect home in Summit County.